Our data shows that product content influences sales. The Takeaway: Check out our new infographic highlighting what types of product content drive conversions. If brands want to succeed in the age of distributed commerce, they must be able to give consumers what they want, when they want and in the manner that they demand it. If they don't, the consequences are simple: Shoppers will go somewhere else to find it. But what do consumer want? We asked them, and the responses were pretty unanimous: Customers want product content. Brands need a centralized place to manage that content, either a traditional PIM system, or modern product experience management platform. Shoppers will only buy items if they are certain they are making an informed purchase decision, and 94 percent of these customers will stop shopping or search for another site if they can't find the product content they need to do so. This is why accurate, consistent and detailed product content is so important. In fact, consumers said it themselves: Eighty-eight percent of shoppers told us that product content plays an "extremely" or "very important" role in their purchase decision. And when it comes to the types of product content that get consumers to click "Buy," it's all about the "Lucky 3s." Shoppers want to read at least three reviews. Eighty-two percent indicated as such, while 87 percent of survey respondents pointed to any product reviews at all as a key factor in their purchase decisions. "Not enough info on a product." "Ordering a product online that looks different than what I receive." "Not enough photos of the product." 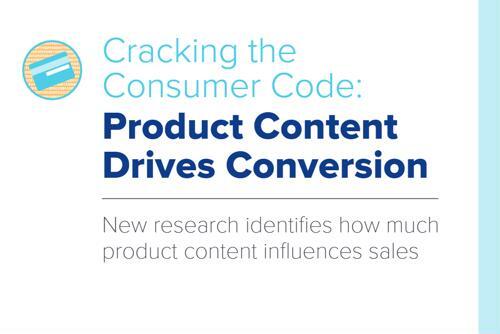 For more information on how to crack the consumer code and drive conversions with product content, check out the infographic below and download our ebook.